Greg Mitchell has been in national politics and government since 1991. He got his start as an intern during his senior year of college in the Pasadena, California, district office of Congressman Carlos J. Moorhead. And after graduating from California State University, Northridge, with a Bachelor of Arts Degree in Political Science, Greg helped Congressman Moorhead win his last two reelection campaigns, as Campaign Coordinator in 1992 and Campaign Manager in 1994. In 1995, he served as District Administrator until Moorhead announced he would retire. Greg then went to work as Chief of Staff to James E. Rogan, who was then the Majority Leader of the California State Assembly. 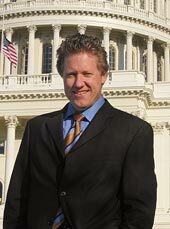 Greg also managed Rogan’s successful campaign for Congress in 1996 and moved to Washington, D.C., to serve as his Chief of Staff on Capitol Hill. At the same time, Greg enjoyed moonlighting as a Bill Clinton impersonator. He appeared in an episode of the Muppets Tonight television show, numerous TV commercials, and countless personal appearances at conventions, retreats and special events. While in Congress, James E. Rogan served on the Energy and Commerce Committee and its Subcommittees on Telecommunications and the Internet, and Energy and Air Quality; and the Judiciary Committee and its Subcommittee on Courts, the Internet and Intellectual Property. Rogan also played a leading role in the impeachment of President William Jefferson Clinton. Rogan was an impeachment manager in the House, and one of the main presenters of evidence in the Senate trial. Impeachment made Rogan a national figure, and during his tenure as Rogan’s top aide and political adviser, Greg designed and directed an aggressive fundraising operation that grew Rogan’s donor database from 4,000 to 45,000 individuals and raised several million dollars. The Rogan-Schiff campaign in 2000 actually set the record for the most expensive House race in history (at that time), having spent approximately $11 million. In early 2000, Greg became one of the co-founders of Digital Campaigns, Inc., a software company that offered online database solutions for political and grassroots campaigns. Digital Campaigns, funded by prominent venture capitalist Tim Draper, was a pioneer company that helped to redefine online applications for campaign databases. Greg served as the Internet Campaign Director for Draper’s Prop 38 Yes, School Vouchers 2000 statewide campaign in California, which was the first to field-test the Digital Campaigns software. While the general campaign was unsuccessful, the Internet campaign was so innovative it attracted a front-page story in the Los Angeles Times—the only front page story of the entire campaign. In 2001, Greg traveled to Arkansas to put the Digital Campaigns software to a second big test, this time for the special election campaign of John Boozman for Congress in Arkansas’ 3rd Congressional District. The client in this case was the Republican National Committee (RNC) and the political team of President George W. Bush, which used the results as a case study to learn what was possible as they were designing programs that empowered their supporters to communicate deep into communities, spread good word-of-mouth and collect data that could be used to effectively target messages. These are the programs that helped Bush win reelection in 2004. 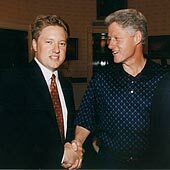 In the spring of 2002, Greg became Vice President of Keelen Communications, a political consulting and fundraising firm headquartered in Arlington, Virginia. Greg served as the business manager of the firm for its founder, Matt Keelen, and also raised money for the campaigns of more than 20 members of Congress. In search of a higher purpose, Greg decided to focus on government reform and improving public policy, and in the late summer of 2003 founded The Mitchell Firm. Greg and his wife, Renee, have three young children—Roman, Gisele and Leonardo. They live in Chantilly, Virginia.